The TTABlog expresses considerable dubiosity about a Trademark Trial and Appeal Board finding of confusing similarity between “SOCK-UM” for a parlor game and “ROCK’EM SOCK’EM ROBOTS” for the action game everyone in their 40’s or so remembers so vividly from ’60’s and ’70’s TV commercials. Yes, boxing robots. Every boy’s dream! Now they — they could be my friends… but first let them pound each other mercilessly until one knocks the other’s block off!! What I found at least as interesting as the confusion finding in the description of the opinion by John was the finding that while ROCK’EM SOCK’EM ROBOTS was a “strong” mark, it was not a “famous” mark. 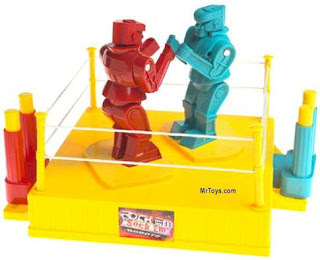 The Board first rejected Mattel’s assertion that its mark ROCK’EM SOCK’EM ROBOTS is famous. Although the mark has been used for several decades, the record did not include sales and advertising figures for most of the period. Sales in recent years have increased dramatically, but “they are not in the same range for other marks that have been found to be famous.” Newspaper and magazine articles have showed that the mark and the game “have recognition for those who played the game in the past.” In short, Mattel failed to meet the requirement that fame be clearly proven. ROCK’EM SOCK’EM ROBOTS not famous?! Am I becoming like those baby boomers who consider their generation the only possible measure of all things? Perhaps. Or perhaps the “famous marks” pendulum has finally, and justly, swung the other way. In any event, the robots did win. I for one welcome our new ROCK’EM SOCK’EM ROBOT trademark overlords! Famous enough that there was a direct visual reference to a “Rock’em, Sock’em” game behind the bar at the end of Reese Witherspoon’s Sweet Home Alabama.